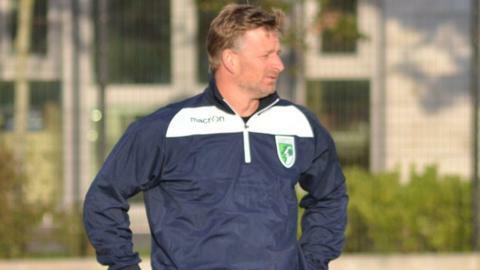 Guernsey FC boss Tony Vance said he had never been so short of players after their 4-0 loss at second-placed Molesey. He named a 14-man squad but had eight first-teamers, including captain Sam Cochrane and forwards Glyn Dyer, Dave Rihoy and Marc McGrath out injured. Stafforde Palmer scored all four of the home side's goals, including an excellent early opener from 25 yards. "Our resources were at an all-time low," Vance told BBC Radio Guernsey. The defeat saw Guernsey drop to 12th place in the Isthmian League Division One South table. Defenders Simon Geall and Josh Steel both played for Guernsey despite illness, but their problems increased when Tom Strawbridge injured his groin and had to go off during the first half. However, Vance was happy with Robbie Legg after the 16-year-old made his debut as a substitute. "Robbie was a huge positive," Vance said. "I know what an exceptional talent he is, but we've got to tread carefully with him because he's very young, but it was great to get him on the pitch and I think he showed everyone what a huge talent he is."